The Salvation Army works closely with local, state and federal agencies to prepare for and manage emergency operations involving violent weather, biohazards, terror threats / attacks, fires, floods and law enforcement operations. The Salvation Army appreciates the strong military presence in our region and enjoys a close working relationship with Mayport Naval Station and NAS Jacksonville. The military community also provides a substantial amount of volunteer support for our programs of assistance at the holidays. The Salvation Army’s Disaster Services division is prepared to mobilize at any time to assist wherever there is a need. 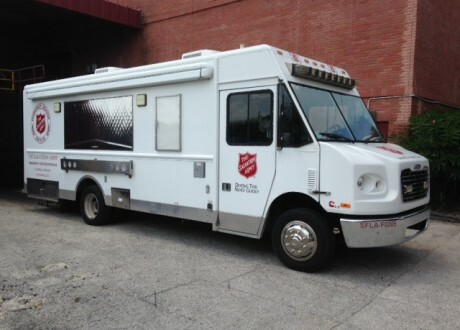 The Salvation Army’s Florida Division includes 45 mobile feeding kitchens, 10 transport trailers, two 48-foot mobile kitchens, cargo trailers, supply trucks, shower units, comfort station tents and supplies, and a state-of-the-art mobile command center. For more information on The Salvation Army’s disaster services, call (904) 356-8641.